We have admired this dog's beautiful breed type since he was a very young puppy and enjoyed the opportunity to work with him. Peter completed his AKC Championship in just 13 shows, earning three 3-point majors and a Group 2 placement. Finnish Ch. Gleanntan Gotwhatittakes - "Morris" (x Ch. Gleanntan Goldminersdaughter) - owned by Thea and Rolf Dahlbolm, Kennel Finnsky and Pirjo and Pentti Aaltovirta, Kennel Skyelight - Finland. Int. Ch. Gleanntan Grand Musicmaker - "DJ" (x Ch. Sonsie Aida) - Residing in Denmark. Ch. Gleanntan Glistening Gatsbie - "Gatsbie" (x Ch. Sonsie Aida) - Finished her AKC championship in 8 shows with four majors and three single points. Ch. Gleanntan Guardian Angel - "Gertie" (x Ch. Sonsie Aida) - Earned seven points from the Puppy class: earned back-to-back majors. Ch. Gleanntan Gettin" Busy - "Ellie" (x Ch. Gleanntan Gee Whiz) - earned her two majors - 3 pt. and 5 pt. 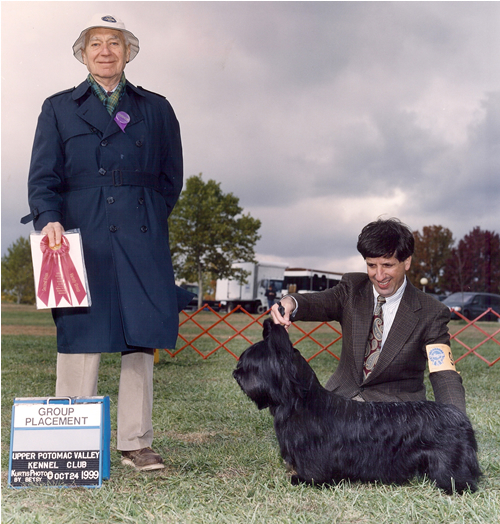 at the Skye Terrier Club of America Supported Entry shows - Canfield, 2004 to complete her championship. Peter is lovingly owned by Joe and Eady Rickard, Princeton, NJ and co-owned by Gleanntan.